Needs Klingon Dagger font to display text properly - font included in zip file. Permission text also included in zip. I don't see an rmskin file or anything I can load into rainmeter. Sorry about that, but I do not use Rainmeter. 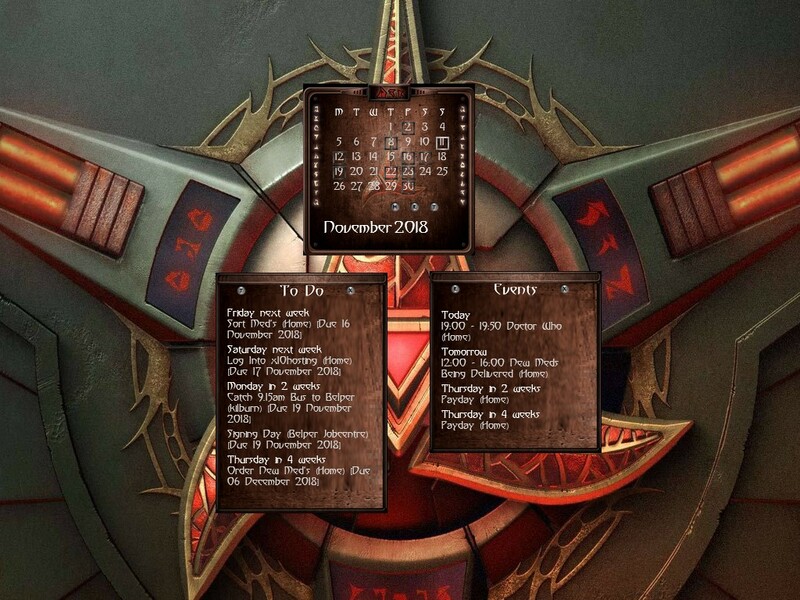 This skin is intended for use with the Rainlendar calendar. However your comment has set me thinking, I will look into the problem and see if I can convert it to work in Rainmeter, but it may take me quite a while to do that as I will first of all have to learn how rainmeter works. I realized my mistake, looking for an rmskin, but still don't see way to load this into Railendar. Next, right click on the Rainlendar calendar and select 'Refresh' from the context menu. Then right click on the calendar again and select 'Options' from the menu. When the Options window opens select the 'Skins' tab on the left hand side of the window. Your new Ja Vacha skin should be listed with all the other skins you have installed. Just select the skin you want and click the OK button at the bottom right of the window. I hope that helps? If you have any more prob's let me know either here in the comments section, or if you would prefer your query to more private you could send me a Personal Message (PM). PS: I almost forgot, to get the full effect of the skin, you will have to install the Klingon Dagger Font. Just right click on the TTF file and select 'Install', and thst's it job done. Although, you may have to refresh the calendar if you install the skin first. Thanks. I figured it out. When I exietd Rainlendar and restarted it it saw the new skin. I guess that's the same as refresh.